Excerpt from Q&A, October 5, 2015. PAT DUDGEON: Yes… Some researchers say that. – Presenter Tony Jones, speaking on Q&A with Professor Pat Dudgeon, a psychologist and research fellow at the School of Indigenous Studies at the University of Western Australia, October 5, 2015. The suicide rate among young Indigenous Australians is high by global standards, and well above the national average. When asked for a source to support Jones’ statement, a Q&A producer referred The Conversation to a series of news reports and online articles. However, the lack of consistency in quality of data and standards for reporting across the world makes it difficult to compare rates worldwide. The Northern Territory has the highest suicide rate of any state or territory in Australia. Data reported by the Australian Institute of Health and Welfare (AIHW) in 2014 showed that in 2010-11, the suicide rate in the Northern Territory was 18.1 per 100,000. At 29.6%, the Northern Territory also has the highest proportion of Indigenous population. The average for Australia is 3%. The high proportion of Indigenous people in the Northern Territory may be a contributing factor for that territory having the highest rate of suicide in Australia. In 2008–2012, the suicide rate for Indigenous Australians was almost twice the rate for non-Indigenous Australians (based on age-standardised rates). For 15–19 year olds, the rate was five times as high as the non-Indigenous rate (34 and 7 per 100,000 population). Suicide rates vary by age. 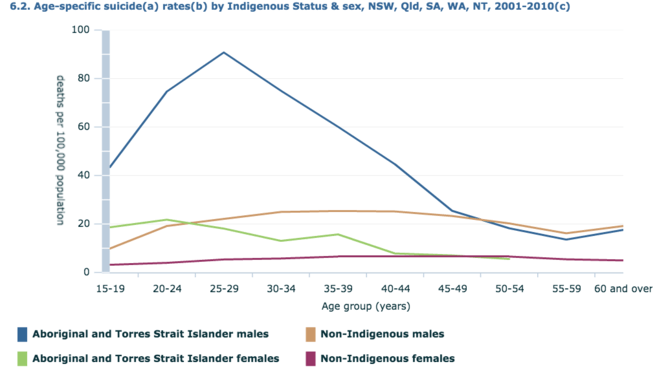 Between 2001 and 2010, the highest rate of any age group in Australia (NT, NSW, QLD, SA and WA) was reported for Indigenous males aged 25 – 29 years. Among this group, the reported suicide rate was 90.8 per 100,000 population. The Kimberley is the region of highest risk with suicides reaching more than 70 per 100,000 Aboriginal and Torres Strait Islanders… The overall national suicide trend is 11 deaths per 100,000 population, but for [male] Aboriginal and Torres Strait Islander people aged 25 – 29 years the suicide rate is 91 per 100,000 population. For [male] Aboriginal and Torres Strait Islanders aged 20 – 24 years the suicide rate is 75 per 100,000 and for [male] children aged 15 – 19 years the rate is 44 per 100,000. The ATSISPEP does not state Aboriginal and Torres Strait Islander youth suicide rates are the highest in the world even if some of us believe that more than likely they are. There is not enough available comparative data for such a conclusive statement, other than speculative likelihoods and reasonable assessments. However we do know that the Aboriginal and Torres Strait Islander suicides when disaggregated regionally, for instance to the Kimberley, to regions of the Northern Territory, to far north Queensland and when viewed from a racialised lens are definitely among the world’s highest rates, tragically… But in the end, it is not a competition of which peoples in our world have the highest rates in the tragedy of suicide – all lives matter. However, we believe that suicide among Aboriginal and Torres Strait Islander peoples is a humanitarian crisis and that it must be highlighted in order that this pressing issue should be responded to as a national priority. You can read his full reply here. Without age specific suicide rates for the world for the same time period, it is not possible to make a definitive assessment on how Indigenous youth suicide rates in the north of Australia compare with rates from other parts of the world. Based on WHO data, the suicide rate for the world is estimated to be 11.6 per 100,000 population. South East Asia reported the highest rate of suicide in 2008 (15.6 per 100,000 for males and females), followed by Europe (14.2 per 100,000). The Western Pacific (that includes Australia), has the next highest, with a rate of 12.6 per 100,000. Looking at age-specific rates globally in 2008, males aged 80+ in the Western Pacific had the highest rates (93.5 per 100,000). The rates for young people in Western Pacific are quite low, according to a 2012 report of WHO data, with rates ranging from 8.5 per 100,000 in the males 15 – 29 age group to 10.4 in the males aged 30 – 22 age group. Lithuania was reported to have the highest suicide rate in the world, with a rate of 34.1 per 100,000 in 2009, followed by South Korea (31.0 per 100,000 in 2009, also included in the Western Pacific region statistics). The rate for Australia is presented in this report as 8.2 per 100,000 for 2006. This is lower than the age-standardised rate of 10.1 reported by the ABS for the year 2006. Data published by the WHO in 2012 reported Guyana in South America to have the highest suicide rate for males (only) with a rate of 70.8 per 100,000. The rate for females was highest in South Korea with a rate of 35.1 per 100,000. The rate reported for Australia is 16.1 per 100,000 for males and 5.2 per 100,000 for females. The lack of consistency in quality of data and standards for reporting across the world makes it difficult to compare rates worldwide. Comparison is made more difficult when some rates are presented as age adjusted rates, while others are not. The suicide rate of 90.8 per 100,000 reported for Indigenous males aged 25 – 29 years is certainly higher than any national rate reported for any other country in global reports. However, some smaller studies have found even higher rates in parts of Asia. A survey conducted in rural Bangladesh reported a rate of 128 per 100,000 for males and females. From India, a study conducted over two years in a rural population in Southern India reported a rate of 120.3 per 100,000 for the period 2006 and 2007. One study on deaths occurring between 1994 and 2002 among those aged 55 years and older (mean age 67.7 years) in an area in South India with a population of over 100,000 people, reported an annual suicide rate of 189 per 100,000. While these studies varied in methods, the findings indicate the possibility that there are other populations in the world who may have higher rates than those reported for Indigenous youth in Australia. Based on data freely available in the public domain, there is insufficient information to support the statement that Indigenous youth in the top half of Australia have the highest rate of suicide in the world. Have you ever seen a “fact” worth checking? The Conversation’s FactCheck asks academic experts to test claims and see how true they are. We then ask a second academic to review an anonymous copy of the article.